Aculon®, an award-winning & proven supplier to numerous industries, introduces Aculon® Multi-Surface Hydrophobic Treatment, the best-in-class hydrophobic technology. For information on purchases or optimization services, please contact us. Aculon® Multisurface Hydrophobic Treatment typically imparts inital water contact angles of around 110 degrees. After significant abrasion cycles, these contact angles are only slightly affected. This technology results in a hydrophobic coating that can be applied to nearly all surfaces. If you have large volume requirements or a specialized application requiring our technical support, please contact us directly. As part of lab services business we regularly work with customers to implement our technology for your process or application. These services include optimizing a process to treat your parts at our facility or provide you with the technical support including materials and procedures to treat at your facility. Click the button below to submit your information and an applications expert will reach out to see how we can assist. Please note we are a B2B company and do not support consumer inquiries. Aculon® Multi-Surface Hydrophobic Treatment is relatively durable relative to competitive nanoscale repellent treatments. Unlike other technologies requiring surface microstructuring (inherently very fragile), Aculon® technology is a non-toxic chemical treatment which physically adsorbs onto the surface. It does not covalently bond however so it is not meant to be permanent! Just how durable or how long will the treatment last? Well that depends on the part and application! Depending on the exposure conditions a lifetime of days to years can be expected! Note that, in most cases, Aculon® Multi Surface Hydrophobic Treatment is intended to be a temporary treatment where re-application is acceptable. You should test to determine the lifetime of the treatment on your particular application to determine a reapplication schedule. Aculon® Multi-Surface Hydrophobic Treatment ranges from 10-500 nm thick depending on application method. It is physically bound to the substrate and thus very stable. While it will reduce impact damage as the Aculon® treatment make the surface lubricious and therefore more likely that impacts to glance off the surface, the treatment is too thin to add any direct scratch or gouge resistance or hardness to the part. The lifetime will depend on the applied thickness of the coating (see application methods) and the abrasive action. Reapplication may be needed after a few days in aggressive environments and may never be needed on parts that see zero abrasion. Aculon® Multi-Surface Hydrophobic Treatment is impacted by UV over time. The level of degradation depends on exposure time & intensity. Anywhere from weeks to months before reapplication is required can be expected. Aculon® Multi-Surface Hydrophobic Treatment is not intended for outdoor applications where a permanent treatment is required. Aculon® Multi-Surface Hydrophobic Treatment is stable to 250C before the chemical structure is damaged and performance impacted. There is no known lower temperature threshold which damages the treatment. Though beneficial, cleaning is typically not required for this technology. See cleaning tabs for options should you wish to prepare the surface with cleaning. Apply Aculon® Multi-Surface Hydrophobic Treatment via dip bath to fully treat parts with a uniform treatment ensuring even coverage over entire part. Contact us now to see how we can work to implement this solution into your facility. Typically results in treatment thickness of 5-40 nm depending on process parameters. Apply Aculon® Multi-Surface Hydrophobic Treatment via an easy to apply wipe. Aculon® Multi-Surface Hydrophobic Treatment can be packaged in convenient pre-moistened wipes. Typically results in treatment thickness of 20-100 nm depending on process parameters. Apply Aculon® Multi-Surface Hydrophobic Treatment via spray gun. Utilize common paint spray equipment for application. Typically results in treatment thickness of 50-500 nm depending on process parameters. Unlike most of Aculon® other treatment technologies a properly cleaned and prepared surface is not required for application of Aculon® Multi-Surface Hydrophobic Treatment. In most cases a degreased and visually clean surface is acceptable. However in some cases cleaning may provide better and more durable performance. Cleaning Methods can be summarized into Good, Better, & Best Options. The below cleaning options assume that the part to be treated has been sufficiently degreased and cleaned of all visual contaminants first. 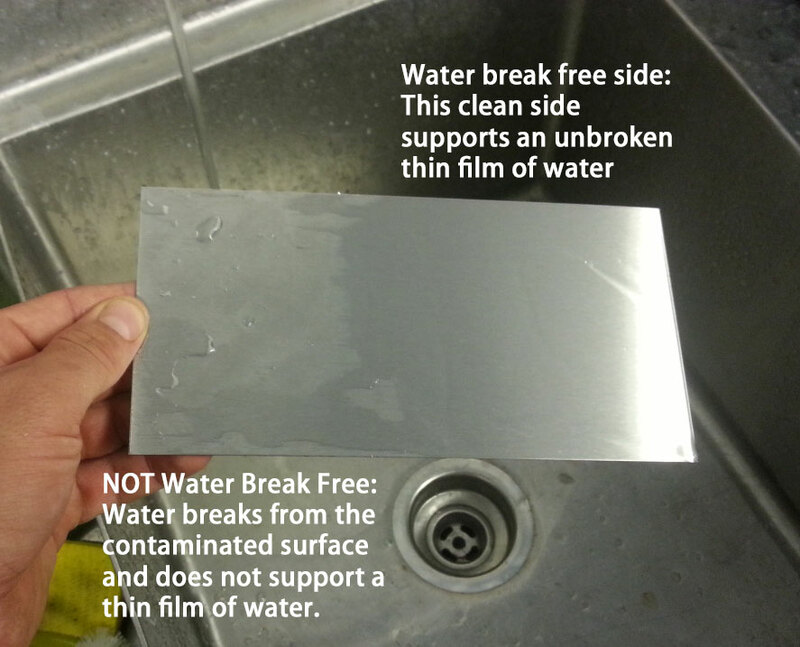 The best results are achieved when a water break free surface is achieved (typically better & best). Not sure what level of cleaning your parts require? Contact Aculon® and we will work with you to determine the level of cleanliness needed for your application and to determine a cleaning method that fits your glass repellency treatment process. How thick is the treatment? How do you know the thickness? Via Spectral Reflectance measurement techniques we can quantitatively confirm thickness after application. Can I see the treatment? It is 100% optically clear if applied uniformly and thinly. When applied at thicker levels and variable uniformity it is possible to see the presence of the treatment. Visible defects can usually be eliminated via buffing with a microfiber cloth. Do I need to clean the part? It looks clean enough. It is always a good idea to clean the substrate prior to application of our coatings. However, it is less important with the Multisurface Hydrophobic Treatment.The need for cleaning will depend on your process, part and durability requirements. How do I know if the part is 100% clean? It is water break free. Note that “good” cleaning options may not clean to this level. Is it superhydrophobic? (contact angle 150 degree plus) No, while very hydrophobic, it is not superhydrophobic. In fact, at the moment a durable superhydrophobic treatment is a unicorn, it does not exist. Current superhydrophobics rely on surface microstructuring and while impressive at first (I know you have seen the youtube videos) are extremely fragile and offer terrible longevity (now go check the Amazon reviews of these products). Is it oleophobic (oil & solvent repellent)? Multi Surface Oleophobic Treatment if an oleophobic treatment is required. Will you sell me a smaller amount to treat my sunglasses or car windshield? Sorry, but at this time Aculon® is a business to business company and is only working on commercial accounts and is not supporting consumer requests. Is it possible to over apply the treatment? No, the treatment can be effectively applied at thick and thin levels.